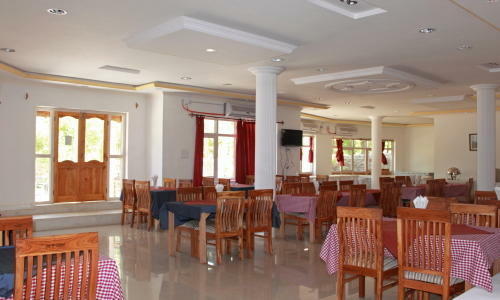 Hotel Reenam is a budget property, nested in beautiful mountains of Himalaya. It is located at 5.4 km from Leh Airport Travel Terminal and 2.7 km from Bus Stand. Several tourist destinations are accessible to the hotel like Prayer Wheel (2.6 km), Leh Royal Palace (2.8 km), Hall of Fame (7 km), Spit uk Monastery (9.4 km) and Thiksey Monastery (19.5 km). The property provides facilities like laundry service, parking space, doctor on call, travel desk, backup generator, room service and lawn. It offers the most preferable accommodation service in artistically designed and decorated rooms that has standard facilities like to ensure a comfortable and pleasant stay. Airport Transportation, Bar, Complimentary Newspapers in Lobby, Parking, Internet/Wi-Fi, Room Service, Laundry Facilities, Baggage Storage on Request, Travel Counter, Front Desk. H/C Water, Complimentary Toiletries, Complimentary Newspaper, Attached Bathroom, Bottled Water in Room, Dustbins, Telephone, Makeup/Shaving Mirror, Luggage Rack, Television Room. User reviews for "Reenam Hotel Leh"